On February 14th, when I heard there had been another school shooting, I admit that I was simultaneously devastated and defeated. Crushed that yet another shooting had occurred, but already completely succumbed to a reality that nothing substantive would change in the tragedy’s aftermath. The shooting in Parkland, Florida seemed to mark another chapter in a story we have read all too many times before. Las Vegas. Sandy Hook. We always hear a lot of thoughts and prayers, but no real action. But this time, the response is different. Or at least it seems different. For a fairly simple, but profound, reason: the young people at Stoneman Douglas High School have organized. They are relentlessly pressuring politicians, organizing wide-scale marches, and quickly becoming a political force to be reckoned with. Their efforts are already achieving results. Republican politicians with long-held staunch views on gun rights are reversing on some of their stances: Florida Governor Rick Scott and Senator Marco Rubio have already indicated support for raising the age for gun purchases and universal background checks. Companies across the country are withdrawing support from the NRA, whose dogmatic beliefs are coming into question as they appear drastically out of step with the mainstream. The road ahead to real change at the state and federal level is long, and some disappointment will be inevitable for these students, who have already witnessed the Florida legislature refuse to even consider an assault weapons ban. But there is no indication the Stoneman Douglas students are going anywhere. Many folks I know have expressed surprise at both the aggressive student response and its immediate relative effectiveness. They shouldn’t be surprised. Whenever we see change in this country, young people are at the forefront. Point to any real social or economic change, and young people have always led the way forward. The story of progress in this country is the story of the young people at the lunch counter in Greensboro, North Carolina, who refused to vacate their seats when they were refused service because of the color of their skin. It is the story of the young people in Stonewall, who fought back when police tried to arrest them solely because they were gay. It is the story of the young people who have asserted that Black Lives do Matter, in response to the surge in police brutality across the country, and have begun to achieve concrete policy change. Our country’s history is the story of young people driving political progress. The current story on gun reform will not be written by adults or legislators: it will be written by these young people, who have had enough, and are pushing, in a dramatic fashion, for change. In the days that followed the shooting, I, and my team members, struggled with the correct response. 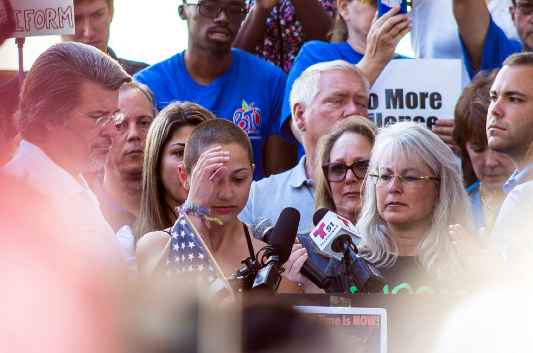 In many ways, the moment was demonstrating the rationale for Generation Citizen’s existence in the first place: the importance and power of educating young people to find their voice. At the same time, there were potential pitfalls to our response . Would we be seen as partisan or taking stances on an issue like gun control? And, perhaps most importantly, would we be usurping attention and energy from the students themselves? These are all valid issues. We decided to respond by sharing a newsletter on the events written by two GC students. I feel that was the right response. At the same time, our organizational tentativeness is precisely why the youth response has become so powerful. These students have no time or patience for niceties. They want to see change, and they want to see it now. This idealism and ability to see the world for what it can be, rather than for what it is today, is why this youth activism has always been so powerful, and so necessary. As I reflected, I realized that I once possessed that same urgency of spirit and activism. When I was in college, I was a leader in a movement to end the genocide in Darfur, Sudan. I helped to organize students across the country, and successfully helped to advocate for colleges, cities, and states to divest their assets from doing business with the genocidal regime. Along the way, I organized protests on the steps of University Hall and the United Nations alike, and was arrested in front of the White House in an act of civil disobedience. I sometimes look back on that time with a sense of frustration, and an acknowledgement that I could have been more informed on the crisis and could have advocated more effectively. At the same time, the strength of my convictions as a young person is exactly why the Darfur movement did achieve relative success: young people refused to accept the reality our society allowing another genocide to occur on our watch, and, through the clear lens of moral clarity, refused to take no for an answer. Now, as I help run a growing non-profit, with staff all over the country, I no longer have the same unrelenting conviction I once did . This is normal, or so I tell myself. I have to worry about our organizational reputation and our interactions with diverse stakeholders from all over the country. I have also seen how hard it is to affect change, hence my immediate reaction of doubt when the shooting unfolded. I’m still relatively young. But sometimes, now, when I see the same behavior I exhibited in college, I see it as impatient, unrealistic, and at worst, entitled. But this inevitable personal transformation is the reason why this surge in youth voice, especially now, matters so much. Impatience and idealism are desperately needed to change a situation that has resisted change for so long. To this end, I would offer two lessons to draw from the current moment. The first is that young people are legitimate, and real, political actors. The recent CNN Town Hall saw a moment in which high school junior Cameron Kasky confronted Senator Marco Rubio. The resulting exchange was explosive. Rubio defended his position. Kasky was unrelenting. Most adults in Kasky’s position would have been more delicate in their questioning of a US Senator. But during that exchange, Kasky and Rubio were equals, a passionate and determined high school junior with informed policy suggestions going against a US Senator whose entire career has been defined by caution. Watching the debate, I was moved- there are few countries in the world where a 17-year old could be literally on the same footing to a prominent politician. This was politics at its rawest, and best. The power of that moment should put to rest the notion that young people do not have the ability, knowledge, or acumen to participate in politics. In the education space, all too often, even when people believe that our youth should become civically engaged and informed, they do not believe they are legitimate political actors. Youth need to be educated first, they say. They need to wait their turn. But as the young people from Parkland have said, the notion of waiting their turn is BS. We need young people to participate as active political citizens now. We are handing the next generation a disrupted economy woefully prepared for the 21st century and an out of date democracy that is at a historic risk of failing. It is not young people who are unable to compromise or legislate in Washington, D.C. It is not young people who are historically polarized. On the contrary, the idealism of young people, coupled with their powerful and real personal experiences, is a necessary antidote to our troubled political times. Indisputably, young people who have been organizing in racial justice movements, as part of the BlackLivesMatter movement are just as ready to lead change as the Stoneman students, but have not received the same amount of attention. Again, that takes nothing away from the efficacy of the efforts to date of the Parkland youth. Rather, it demonstrates the extent to which we need to ensure that every single young person can organize, use their voice, be heard, and take action on issues they care about. And there lies Generation Citizen’s role. It is not our place to insert ourselves into the current gun reform movement. Rather, it’s our obligation to play a vital role contributing to a moment and a movement to revive our faltering democracy by ensuring that young people are front and center. We need to do everything possible to give them the tools they need to succeed. And then we need to get the heck out of the way and follow.